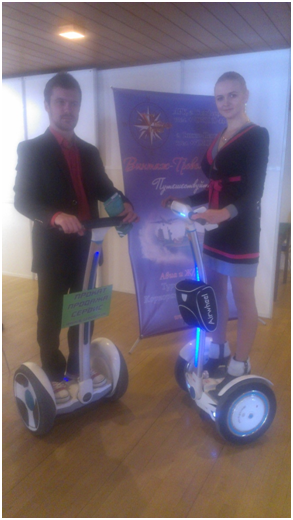 Airwheel's intelligent, self-balancing two-wheeled scooter, the S3, appeared at the Crimea Tourism Show held from March 4-6, 2015 in Ukraine. Judging from its popularity at the event, intelligent self-balancing scooters may be set to become an indispensable mode of transporter in the future. Located on the northern coast of the Black Sea, Crimea owes its agreeable climate and attractive sea view to its unique geographic position. As is eulogized in the Hymn of Crimea "Your fields and mountains are magical, Motherland; Your Sun and Sea salubrious, Motherland;" people are truly proud of the natural views and local tourism sees great potential. The development of tourism encourages the application of new eco-friendly transporter to get around resorts, so when the Airwheel self-balancing unicycle S3 made its debut at the Tourism Show, visitors were amazed by its design and convenience. With the help of the Airwheel team, many people had the opportunity to go for a test drive and found it extremely easy to get the hang of. Using aviation attitude control, a fuzzy logic algorithm and gyroscopic technology, the Airwheel S3 is designed to be light-weight (25kg) and energy-efficient, and can cover dozens of miles with only one charge, making it the ideal transporter for short trips.